We may be small and off the beaten path, but Turks and Caicos is the place to be. There are interesting local arts and crafts to be discovered on Providenciales, including locally-produced jewelry and traditional arts and crafts such as woven baskets, bowls and hats, pottery and paintings. Largely self-taught, Atelys creates jewelry that typically features Caribbean sea glass sourced on the island of Grand Turk and from Salt Cay. The jewelry also showcases distinctive turquoise larimar of her birthplace — the Dominican Republic. If you want to support education, you can’t go wrong by buying a T-shirt from Providenciales company I Want to Live on Island. All of the profits from this local company are donated to school tuition for elementary school-age children in Turks and Caicos whose families have challenges paying for school tuition. Wellington Williams makes jewelry using powdery white sand right from Grace Bay, and his creations have become popular must-haves for anyone visiting Providenciales. 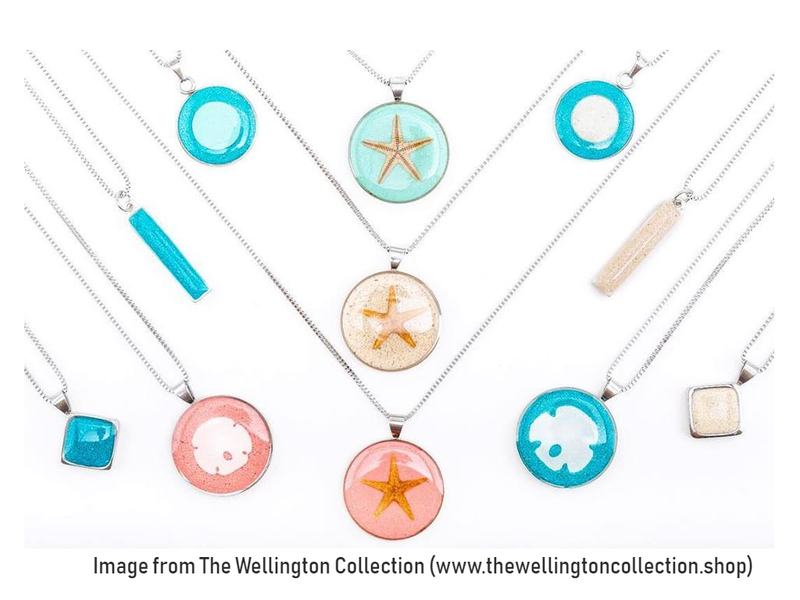 “Shells, sea glass, conch, seeds of plants… anything I can wrap, put a hole through or set in resin, I can definitely make jewellery out of it,” says Wellington, a Turks and Caicos native. The 20 year old’s “Wellington Collection” of sand jewelry sells at 18 locations across Providenciales and Grand Turk. The success of Wellington’s line of jewelry, introduced just two years ago at the Providenciales Fish Fry, has allowed the craftsman to resign from his full-time job, and devote his time to creating unique jewelry. In fact, Wellington has been so successful he now has his own shop in Salt Mills Plaza, a short drive by car from the Tuscany on Grace Bay. Run by Providenciales residents Tito and Miami Seymour, Represent Turks and Caicos offers uniquely designed handicrafts that help promote the Turks and Caicos Islands. As well, local artists, restaurants, and current Island events are often on featured on the company’s Facebook page to help promote our local local economy. The goal is to encourage tourists, locals and visitors to shop and support our local businesses. “Certified Turks and Caicos Islander” shirts, “Turkoiselife” apparel and TCI flag inspired trap sacks have become a must have at the Thursday Fish Fry and other Providenciales events. The business has also expanded to multiple product lines, all handmade right here on Provo. Also located in Saltmills, Anna’s Art Gallery and Anna’s Too offer a unique insight into the “real” Turks and Caicos. Offering one of the largest selections of original artworks and crafts on Providenciales, you can find unique and original paintings by local artists, as well as locally designed jewelry, crafts, quirky and cool gifts. What Treasures Have You Discovered? Do you like shopping on Provo? If you do, leave a comment below and let us know your favorite shop, and what treasures you have discovered!